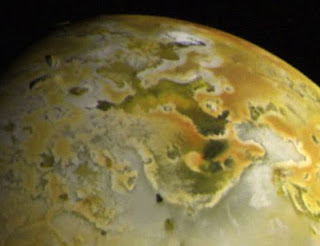 Io is the innermost of the four large moons of Jupiter known as the Galilean satellites. 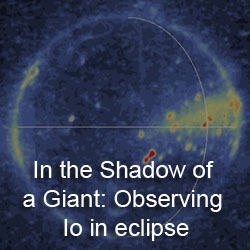 Io is a little larger than the Earth's moon but has a surface that couldn't be more different. 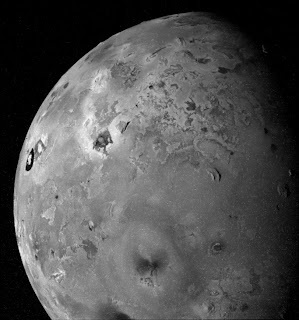 While the ancient surface of our moon is dominated by impact craters and large basalt "mare" provinces that are 3-4 billion years old, Io's surface is continuously being renewed, with more than 400 volcanic depressions known as a paterae and more than 130 mountains, the vast majority of which are created by tremendous compressional stresses in Io's crust. The engine for this violent volcanic activity is tidal heating. Io's orbit is slightly eccentric and Jupiter's gravitational pull on Io varies over the course of an Ionian day. The moons Europa and Ganymede help to prevent Io from circularizing its orbit, keeping the heat engine in Io's mantle running. 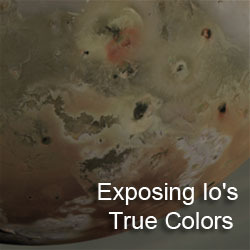 On Wikipedia, check out the Io and Volcanism on Io articles. Both are featured articles on the online encyclopedia, representing some of the best content there. Plus, I regularly review content changes to those articles in order to maintain their high quality. 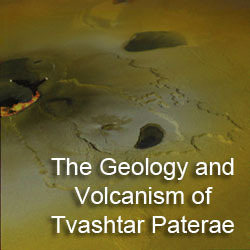 I am also beginning to prepare more articles on several of Io's volcanic features, such as Pele, Masubi, and Tawhaki Vallis. The USGS has a website dedicated to planetary nomenclature, or surface feature names. Their section on Io provides a list of official names used for volcanoes and mountains on Io. Looking for a map of Io? Scientists at the USGS office in Flagstaff created a basemap based on Voyager and Galileo images of the satellite several years ago. Several versions of this map can be found on their website as well as a PDF version of the color basemap with feature names added. Looking for images from the Voyager, Galileo, or New Horizons spacecraft? A good place to look for officially released versions of spacecraft images is the Planetary Photojournal, which has a page for Io images. I also have a page where I've done my own processing of the raw data from Voyager, Galileo, and New Horizons. I hope you all enjoy you visit to the Gish Bar Times!